Urban jungle 2015 | J.Harms. Urban jungle 2015. Acrylic on white paper. 22×30,5 cm. J.harms. Edition of 29 limited prints. The Date (see post) and this painting come from the same day of wandering around the Sacré Coeur. I couldn’t help but think that all these cars were like a pack of sleeping animals nestled in the urban jungle. I love the composition of this one, with the trees in the foreground. That’s hard to do, so that they don’t overpower the scene, but break it into pieces they way they do, so that we just glimpse parts. So much more interesting than the scene alone without them – we have to participate. I imagine myself looking through the trees at this vista. Just great. My thought exactly ! The trees in the foreground invite you to participate. At first it seems like they’re blocking the view but they do exactly the opposite. thanks for your comment ! really nice painting, colours, composition and everything else! Thank you very much ! you made my day ! 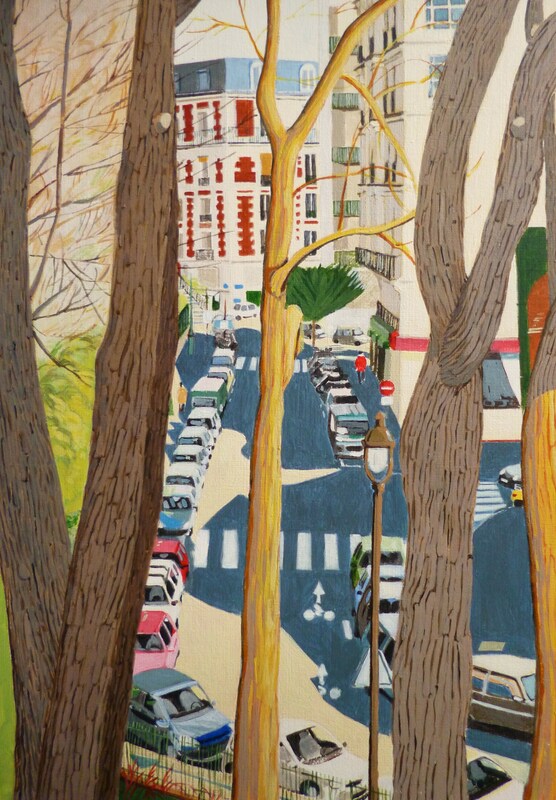 the composition is great Julie – the painting really leads you into the street as the main focal point – and it’s interesting that the trees actually visually force you to do this..